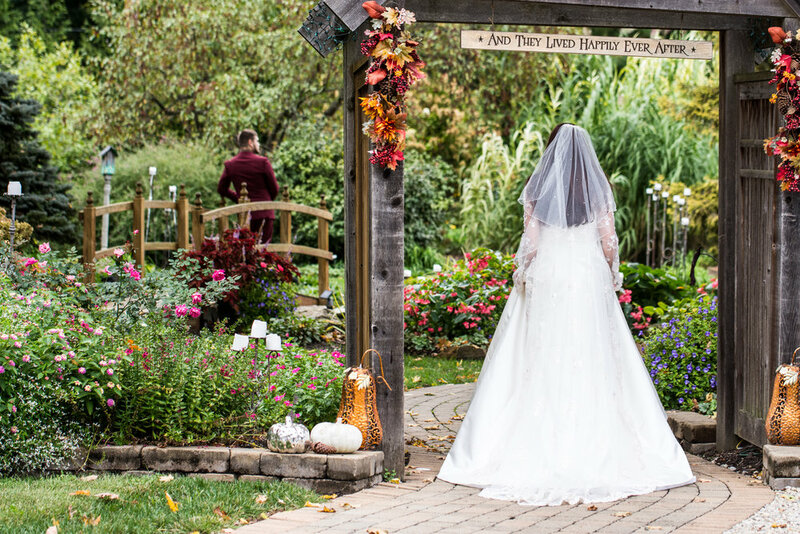 This small October wedding took place at Avon Gardens in Avon, IN. 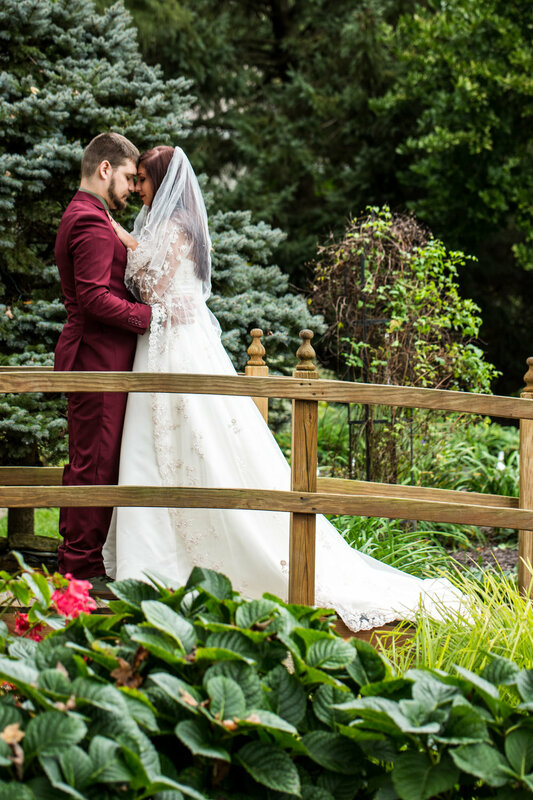 In early October the leaves on the trees in Indiana are typically still green as was the case for this wedding day. 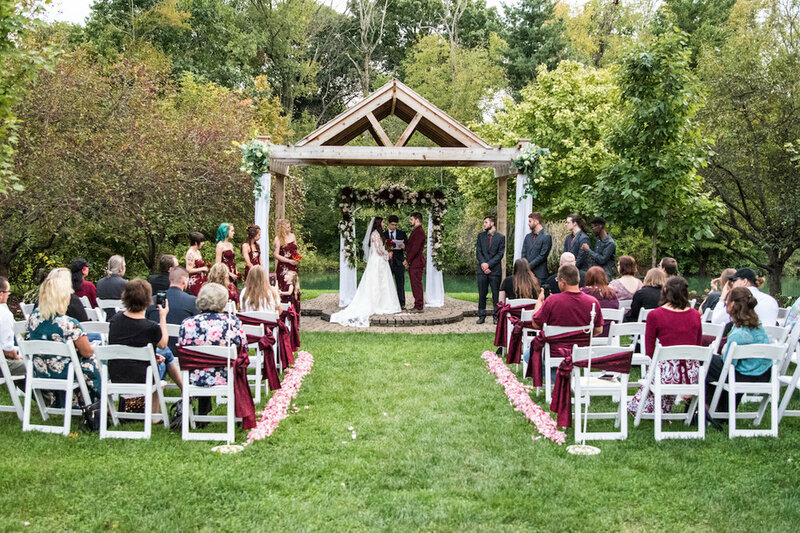 The ceremony site is a secluded lawn, a pond sits behind a wooden arbor decorated with burgundy and pink flowers to match the couple's wedding colors. 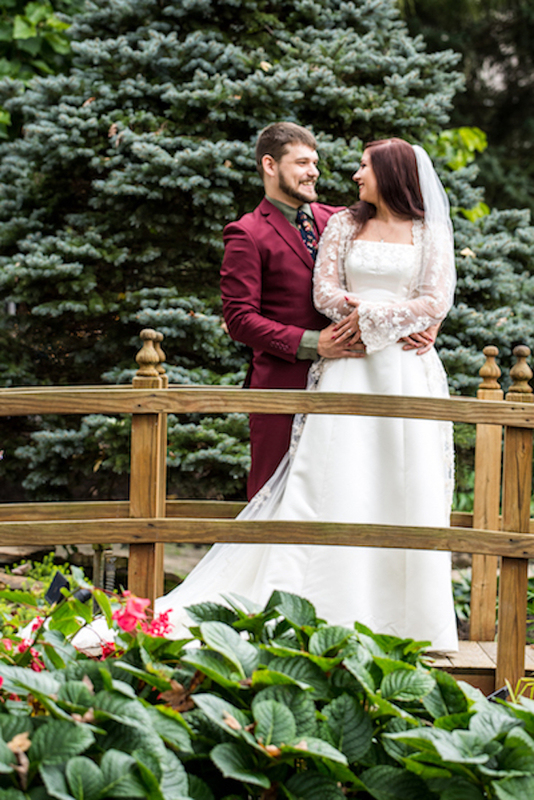 The bride and groom stand atop a cobblestone platform to exchange their vows in front of their closest friends and family. 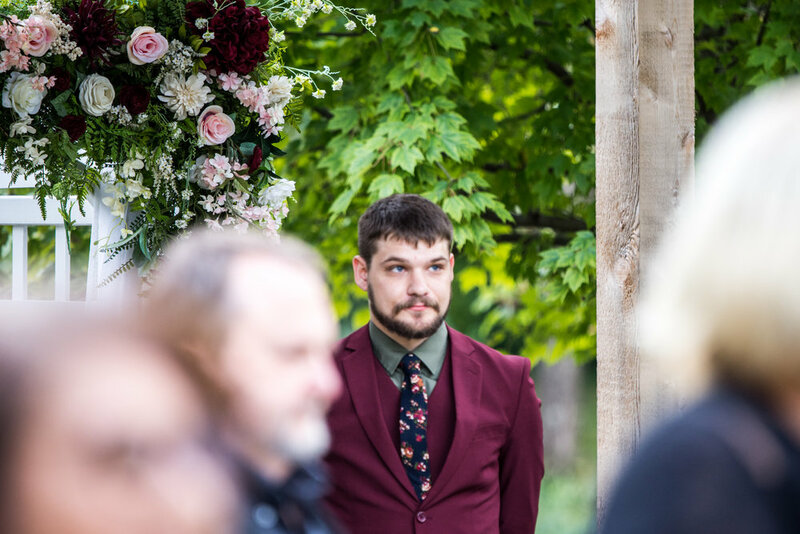 Burgundy ribbons are tied around the white guest chairs lining the aisle and pink flower petals created a defined path for the bridal party's processional. The bride wore her step mom's wedding dress, the train of which spills over the platform. 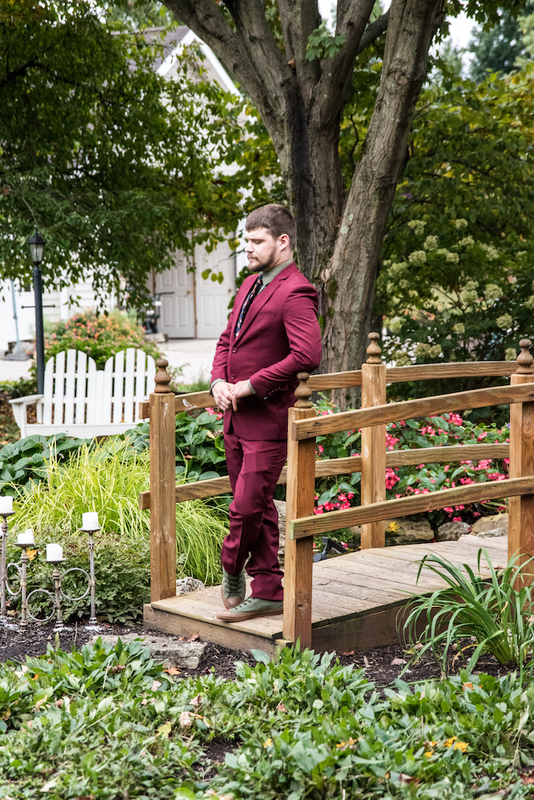 The groom wore a handsome Burgundy suit and sage green shoes. The bride had four bridesmaids who all wore burgundy floral printed dresses, the maid of honor was the bride's sister. The groom had three groomsmen in charcoal gray suits as well as one dog handler who can be seen standing with the groomsman although the couple's dog is not visible in this photo, he was there. As evidenced by guests holding up their cell phones this was clearly not an unplugged ceremony. 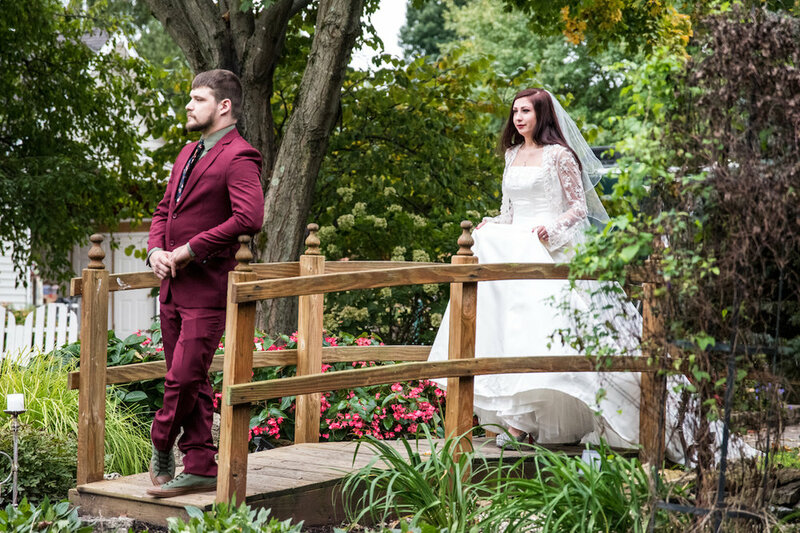 The couple chose to have a first look at the bridge on the property. 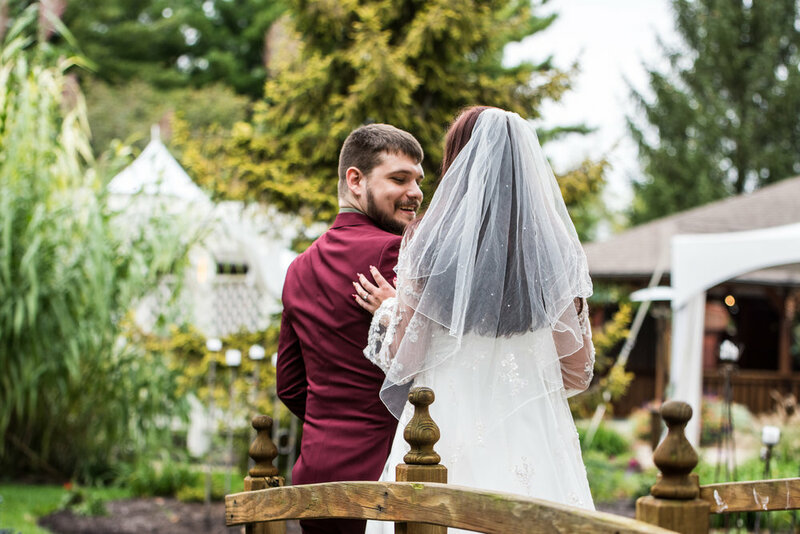 As the bride was walking down the stone pathway towards her groom I couldn't help but notice that she passed directly under the "and they lived happily ever after sign" hanging from the archway and I knew I had to capture the moment. Her groom can be seen standing on the bridge in the distance with his back facing the camera. The first look allowed the couple time to walk the gardens and photograph couples portraits prior to their ceremony. Avon Gardens sprawls across more than five acres! 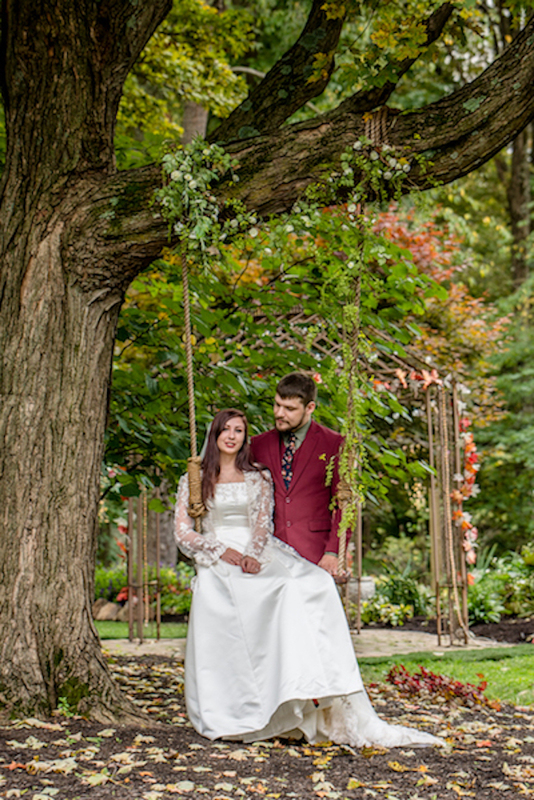 We chose the winding paths throughout the gardens to capture the couple's portraits and the tree swing makes for the sweetest photo op. 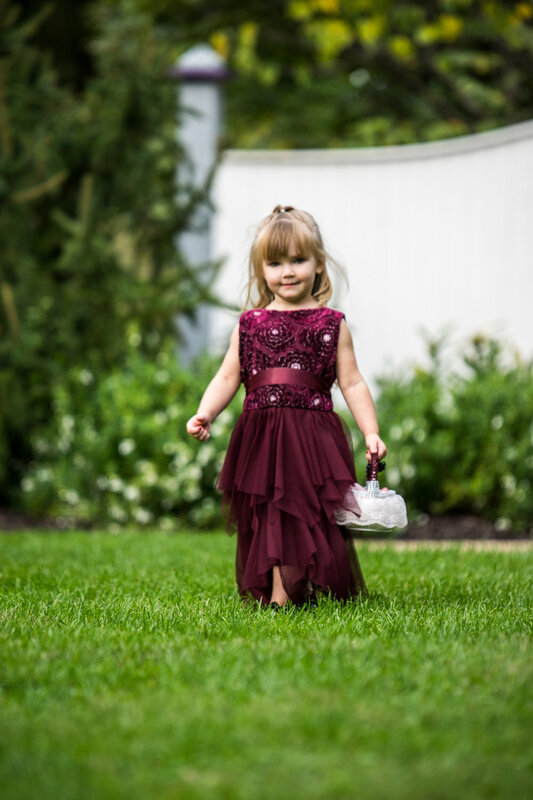 The flower girl at this October wedding was the bride's three year oldniece. 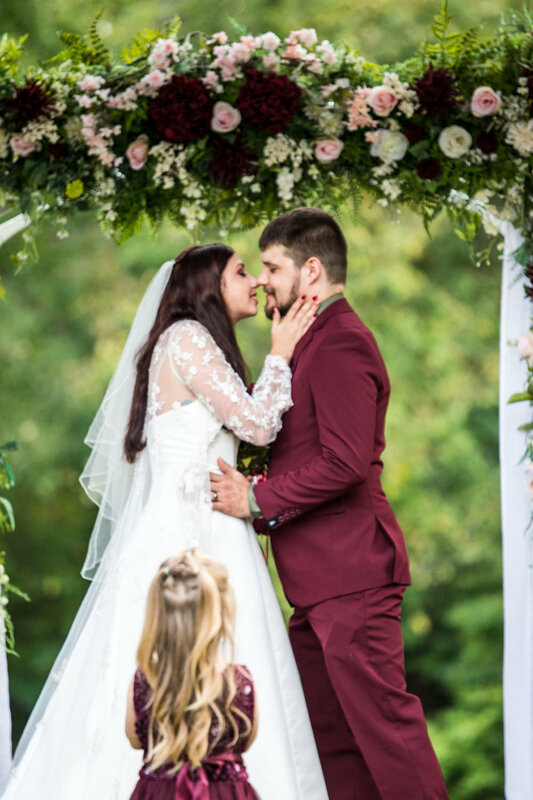 When the little girl saw her aunt she ran over to show her the pretty dress she was wearing for her wedding day and leaned in to give her a kiss. The flower girl was completely mesmerized by all the wedding day festivities and bebopped between the bridesmaids and her aunt during the ceremony. When it came time for the couple's first kiss the little flower girl happily watched from the aisle. The property was decorated perfectly for October with pumpkins and gourds with many of the flowers still in bloom. 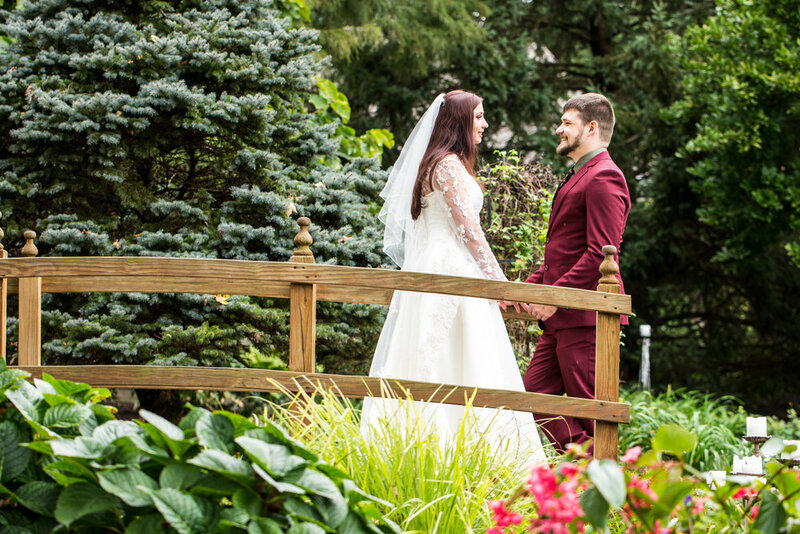 You can see white candles lining the winding path to the bridge, they are lit and attended to by the venue's staff as night falls over the gardens creating beautiful photo opportunities. 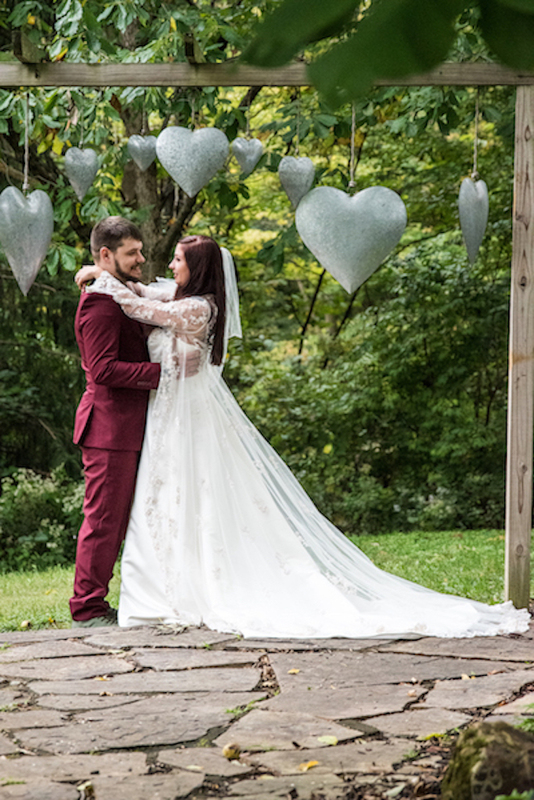 We are honored to have captured this very special day for this lovely couple. We wish them a lifetime of love and happiness.